In our quest to make the new Interactive Timeline even better, we combined Forecite and the Interactive Timeline, but we didn’t stop there. We also created a feature called “Explore Case Relationships” to give you even more information about your search results. 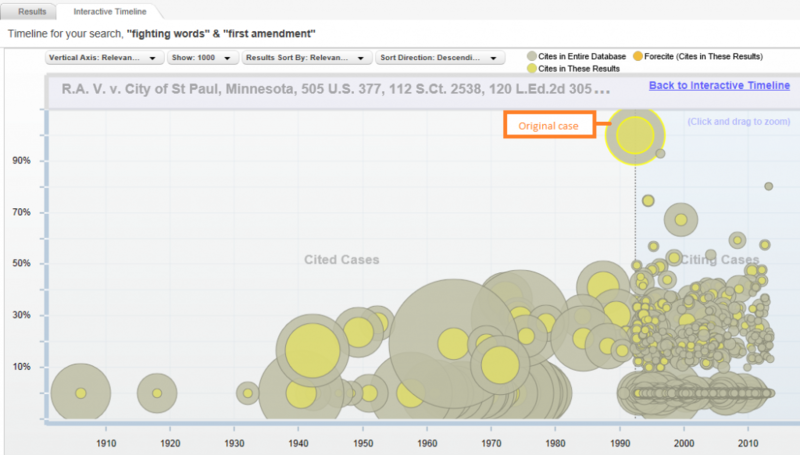 Now users can click on a specific case in the Interactive Timeline and get a new Interactive Timeline of the cases cited within that case as well as the cases that cite back to the original case. 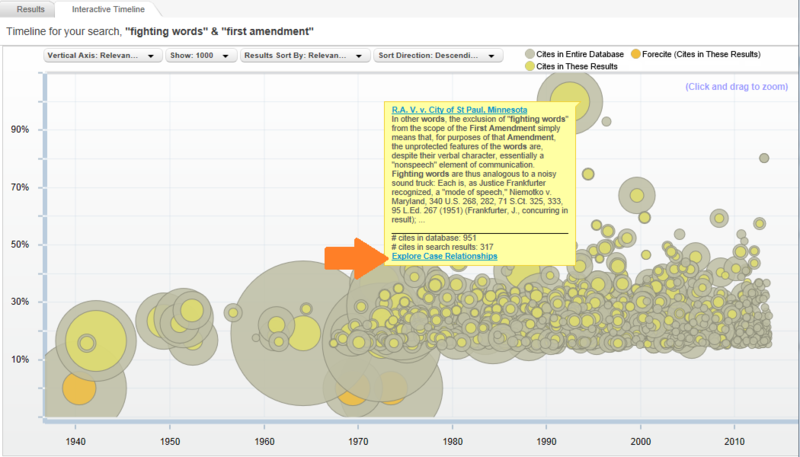 We ran a keyword search for “fighting words” and “first amendment.” We’re interested in one case in particular, so we rested our mouse over the case circle and called up the case information. To see what cases R.A.V. v. City of St. Paul cites as well as what cases cite to R.A.V., click on the blue “Explore Case Relationships” hyperlink. Now you can see our original case is in the middle of the screen. To the left of the case you can see all the cases cited to in the R.A.V. opinion. To the right are the cases that cite back to R.A.V. (the later-citing cases). To read any of the cases, click on an individual circle, then click the blue hyperlinked case name. To get back to the original Interactive Timeline, click the blue “Back to Interactive Timeline” hyperlink in the upper right hand corner.